The popular Mother Dairy brand of milk, which is a part of the Gujarat Co-operative Milk Marketing Federation (GCMMF), has now become the world’s largest producer of milk. Now the Indian way of supplying daily milk to the customers in the form of plastic pouches is also being adopted by Western countries and even in Pakistan. 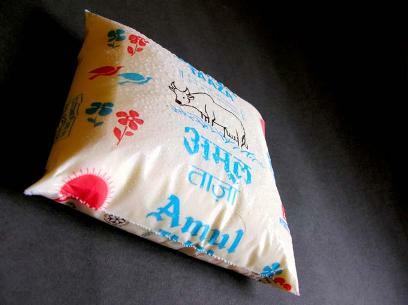 The demand for milk pouches in the country has increased and the marketers of the Amul brand have increased the milk producing capacity of the Bhat village plant, based near Gandhinagar in Gujarat. Earlier, the plant had a capacity of producing 8,000 metric tonnes of milk film and now it can produce 17,000 metric tonnes per year, as it carried out an expansion program worth 80 crores. Moreover, the milk major has also decided to increase the capacity of producing milk film from the present 17,000 metric tonnes per annum to 34,000 per annum by next year. If all the dairy brands are put together, then a total of 8 crore milk pouches will be sold across the country everyday. Out of these, Amul accounts for 1.80 crore milk pouches. The managing director of GCMMF, R S Sodhi, said that even after expansion, the entire capacity of the Gandhinagar plant is being fully utilized for packaging their own products, including milk, buttermilk and curd.